It’s finally time to eat and drink! “Today is the beginning of new glamour in Los Angeles,” announced actress June Lockhart, the emcee at yesterday’s ribbon cutting ceremony at Clifton’s Cafeteria, which officially opens next Tuesday. With Mayor Eric Garcetti, Councilman Jose Huizar, and Clifton’s owner Andrew Meieran looking on, Lockart fondly reminisced about eating dinner with her parents at the cafeteria as a young girl in the 1930s. And now, a whole new generation will have the pleasure. Here are 5 things, flavored with nostalgia, that we tried at yesterday’s preview of the newly revamped Clifton’s. “I know that the number one question on everybody’s lips is, ‘Are we going to still have Jell-O? '” joked Meieran. The answer, of course, is yes, but as Clifton’s executive pasty chef Michael Luna told The Digest last week, “We’re just going to look for new and inventive ways to serve it.” Yesterday’s presentation was a departure from the big squares of the jiggly stuff that they used to serve on decorative leaves of lettuce; this time, it came in a parfait layered with fruit, pudding, graham crackers, and marshmallows. It still hits the spot. 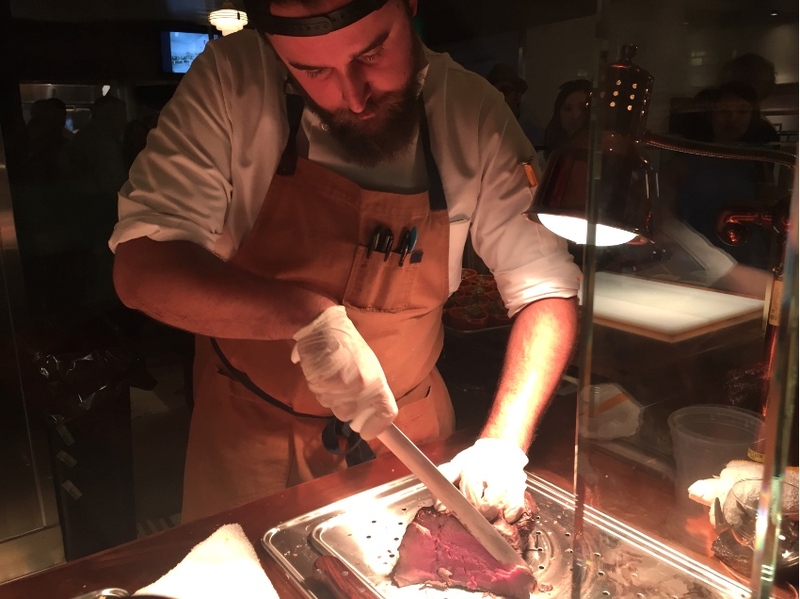 Those manning the old-fashioned carving station served up slices of roast beef, ham, and turkey. Sides like mashed potatoes and gravy and stuffing topped with cranberry sauce mean you can eat like it’s Thanksgiving all year ’round. “I don’t know if you’re into creamed spinach, but this one is great,” a fellow diner said to me. If you prefer a less formal plate, there’s also pizza, grilled sandwiches, soup, and chili to be had. 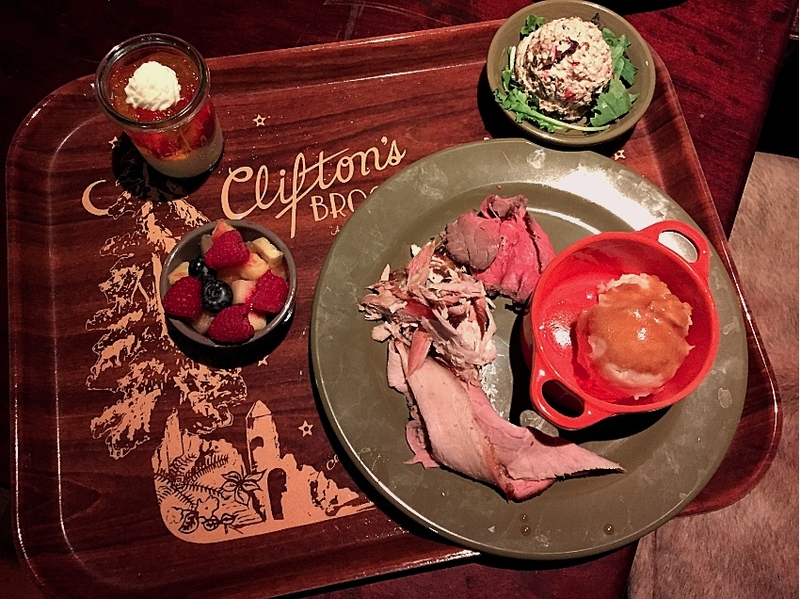 There aren’t too many places where you can get a side of tuna salad, but at Clifton’s you can. And with those bits of olive, it’s pretty good. There was also a Waldorf salad with asparagus and tangy avocado dressing and little fruit cups with berries and pineapple. 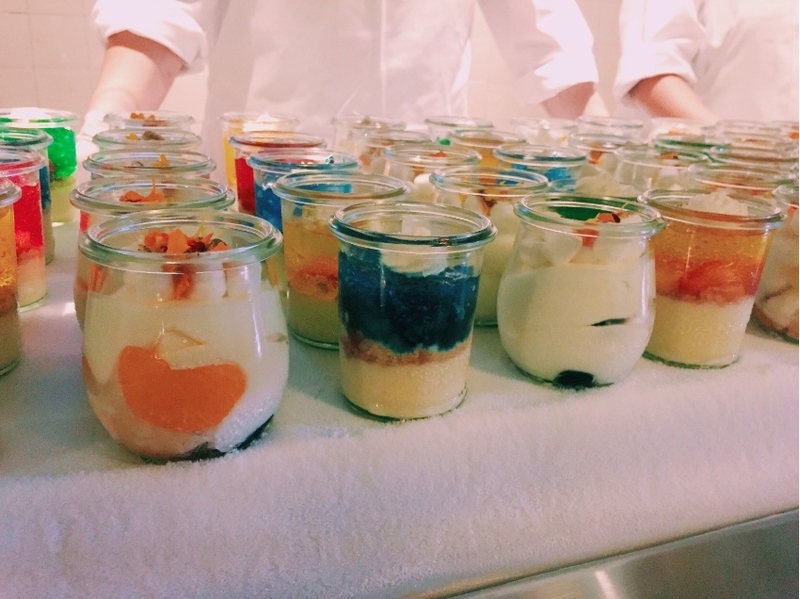 Additionally, there’s a full-service salad bar, where guests can customize their own creations with the help of a server. 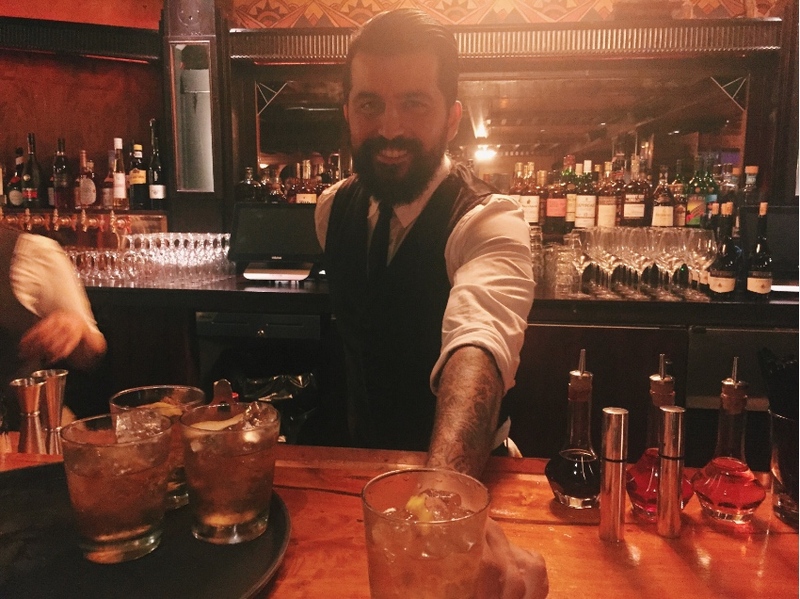 Old fashioneds and moscow mules made the rounds at yesterday’s event. They’ve certainly got drinking covered at the new Clifton’s—along with the second-floor bar, which will focus on classics and craft beer, eventually there will also be a tiki lounge and two other bars. Starting next week, the second-floor bar will be open, starting at 11:00 am, and soon after, the drinks will begin flowing at 7:00 am. If Jell-O doesn’t do it for you, don’t worry. There are plenty of alternative desserts, including Clifton’s classic white sheet cake with sprinkles. For some of the selection, original recipe cards were consulted. 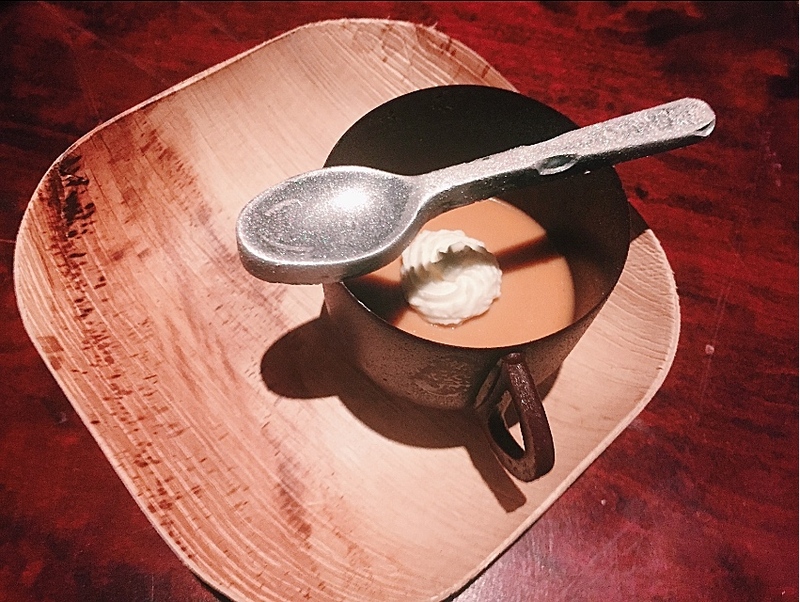 A favorite of pastry sous chef Janet Greenblatt is the butterscotch budino. “You can eat the cup!” she told me. You can also eat the spoon, which is solid chocolate underneath the glitter. Clifton’s is located at 648 S Broadway, 213-627-1673 It officially opens next Tuesday.